The galaxy has been a peaceful place for many years. After the ruthless Terran-Hegemony War (30.027 - 33.364), much effort has been employed by all major spacefaring species to prevent the terrifying events from repeating themselves. The Galactic Council was formed to enforce precious peace and it has taken many courageous efforts to prevent the escalation of malicious acts. Nevertheless, tension and discord are growing among the seven major species and in the Council itself. Old alliances are shattering and hasty diplomatic treaties are made in secrecy. A confrontation of the superpowers seems inevitable - only the outcome of the galactic conflict remains to be seen. Which faction will emerge victorious and lead the galaxy under its rule? 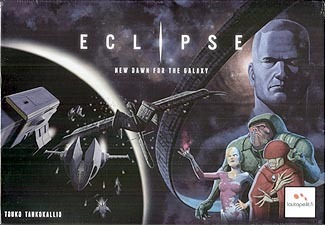 A game of Eclipse places you in control of a vast interstellar civilization, competing for success with its rivals. You will explore new star systems, research technologies and build spaceships to wage war with. There are many potential paths to victory, so you need to plan your strategy according to the strengths and weaknesses of your species while paying attention to the other civilizations' endeavours.